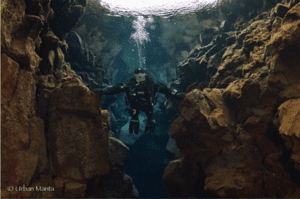 Hedinn of Dive Iceland between the tectonic plates at Silfra! This trip was amazing and if you’re interested in diving the intercontinental divide we can chat about affordable suit heaters, etc. during your training! disconnecting the drysuit inflator valve while diving and the tuck-and-roll technique to dump air trapped in feet. The drysuit itself holds air throughout the entire system and you need practice to master the new buoyancy system. 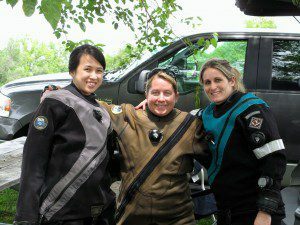 The drysuit teaches proper scuba diving form and trim as you must use proper body positioning so the air is level throughout the suit. Proper form increases efficient muscle use (and therefore air consumption) even in a wetsuit. Work on more efficient finning techniques such as the frog kick. I have researched an affordable suit heating system for students. 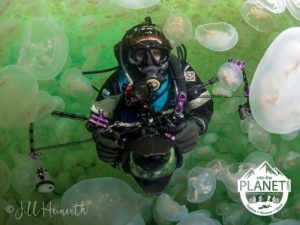 Whether you want to dive Silfra in Iceland or go Ice Diving with me, I’ll teach you how to stay warm safely! Drysuit, drysuit undergarments, drysuit seals, tanks and weights will be provided. Students must bring regulators and a BC or they can rent these from Urban Manta. Students must bring their mask, snorkel and fins. You’ll most likely need a hood and gloves and Urban Manta has those in stock in your size. SDI eLearning for the drysuit can be purchased here for $139.95. What separates my teaching style from check the box teaching styles is that my students learn proper trim, buoyancy and team/environmental awareness. No skills on knees (even for Open Water) or dropping like a rock feet first, fin or hand sculling, out of control and without your buddy. These are all habits that you won’t have to unlearn in the future and you’ll learn why they’re important during training. If you learn to be in control of your body and buoyancy then you won’t have to dive stressed out. I do not run cattle call classes with students on their knees. I teach people how to actually dive. How and why? Cave divers tend to be more meticulous divers than anyone else on the planet. I’ve trained with some of the best ones around the world and I continue to train with them to fine tune skills such as scootering thousands of feet into caves with multiple open circuit stage or closed circuit bailout bottles.